Lenovo just added a new member to its flagship tablet family with the 13-inch Lenovo Yoga Tablet 2 with Windows. 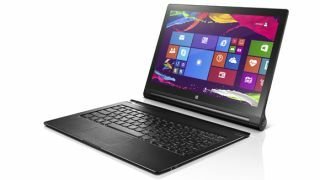 This new and larger Windows-based Yoga tablet follows in the footsteps of the 8- and 10-inch versions announced earlier in October. The new Yoga Tablet 2 with Windows essentially matches the Android-equipped Lenovo Yoga Tablet 2 Pro, with a 13.3-inch quad HD display, 1.86GHz quad-core Intel Atom chip, 15-hour battery, convenient kickstand, and 64GB of removable storage. Besides the obvious difference - Windows 8.1 instead of Android - the new Windows-based 13-inch Yoga Tablet 2 also lacks the Android version's built-in projector, as well as its rear camera, opting instead for just a 1.6-megapixel front camera. However Lenovo notes in the tablet's specs sheet that these details will vary by region. Like other Lenovo tablets, the just-announced Yoga Tablet 2 ships with a Bluetooth keyboard cover, making it a powerful laptop/tablet hybrid. Lenovo is also making a big deal out of the tablet's onboard subwoofer and dual "large-chamber speakers." The 13-inch Lenovo Yoga Tablet 2 with Windows will launch in November starting at $700 (about £440, AU$800). So far the tablet is only scheduled to launch in the US and China, Lenovo confirmed with TechRadar.